It’s smart to select two Internet providers. It’s even smarter to select two diverse Internet providers. In the event that one ISP were to fail, the other should be ready at all times to support your daily operations and avoid losing valuable productivity and revenues. Invest in an Internet backup solution, a disaster recovery option, or a business continuity plan to ensure that your office never loses connectivity to precious cloud applications and resources. For seamless business continuity, NewConnect constructs two or more route paths from the customer location to the Internet backbone gateway. Each path terminates at two distinct, geo-diverse gateway locations and remains active at all times. Should a path go down, the available path will automatically carry all traffic without any downtime or human interaction. 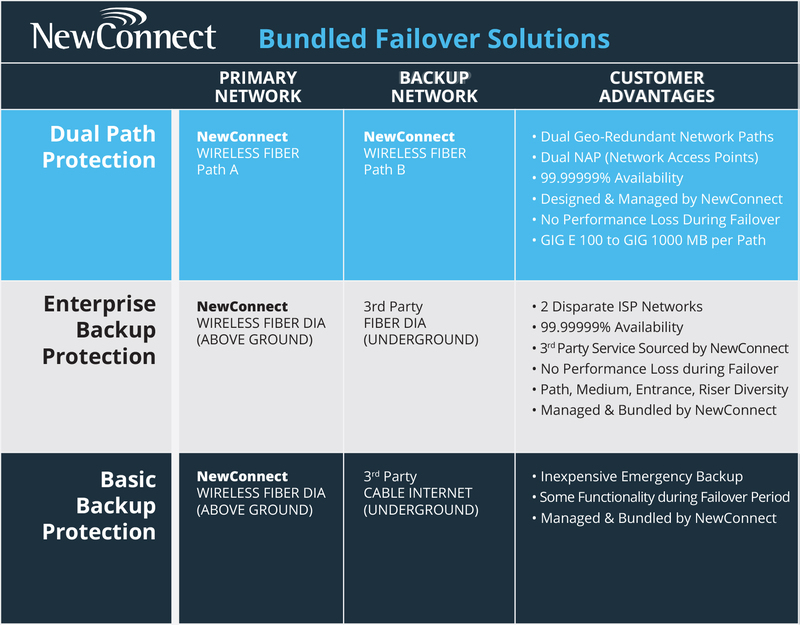 NewConnect will deliver its Wireless Fiber connection, as well as a third party connection, for a complete auto-failover Internet backup solution. NewConnect’s last mile access routes through the air, enters the building from the roof, and wires down to the customer suite, bypassing all other provider’s underground fiber, copper, and coax infrastructure for the highest level of network diversity and availability. For businesses that cannot afford multiple premium providers for business continuity, NewConnect will bundle your Wireless Fiber primary link with a third party cable backup for an emergency failover connection. Avoid expensive downtime, revenue losses, and payroll losses. Maintain essential business operations during premium downtime. Take out an inexpensive insurance policy against network downtime. Customers have the option to procure services with the cable provider or let NewConnect source and bundle the back up for you. NewConnect can work with your IT personnel or directly provide IT support as a managed auto-failover solution. Never Lose Internet Connection Again.